Mary Green shows how our waterways are great for wildlife. “If Candlemas Day is fair and bright/ Winter will have another flight” goes the old saying. Candlemas Day (February 2), also known as St Brigid’s Day, Imbolc and Groundhog Day, is a turning point in many traditions, being half-way between the winter solstice and the spring equinox. On this day the weather was supposed to predict the rest of the winter’s weather. This year Candlemas Day was indeed “fair and bright.” Oh dear. Actually it is likely the prevailing mild wet westerlies will continue, with the flooding they bring. The tension between human intervention and environmental protection has raised its head again on the Somerset Levels. If you don’t dredge the rivers, villages and farms will stay flooded. If you do, wildlife will be lost. The answer is that we have to find a balance: enabling people to live their lives there and doing this in as wildlife-friendly a way as possible. I do find it strange how people see “nature”. There has been a trailer for the BBC’s Olympic coverage with the strap-line “Nature – who will conquer it?” If we could “conquer nature” the planet would be dead and so would we. Learning to live in and with nature is the challenge. It seems an appropriate time to write about water. I heard someone on the radio say that we take one of our most important resources, water, clean it at great expense till it is pure enough to drink, then circulate it through our toilets and throw it all away again. Water is vital to human beings, but like all our resources we haven’t yet learnt how to live with it and use it equitably. For a landlocked Midland area, we have a lot of water. The River Arrow and its feeder brooks run through us, the Birmingham-Worcester canal has been here for a couple of centuries and the Bittell, Tardebigge and Cofton reservoirs provide larger stretches of water. The landscape is also dotted with ponds, some of which were old marl-pits from clay digging, or quarries from gravel workings. All of these contribute to the wildlife of our area, to its leisure and, especially in previous years, our economy. I was surprised to find that the River Arrow has poor water quality and only moderate biodiversity. It is not much seen or celebrated in our area, being mostly on private land without public access and having no riverside walks or known “beauty spots” to speak of. Further down towards Redditch it is much more accessible and there are some lovely walks – in the Arrow Valley Park and around Studley, for example. Despite this, there are some attractive stretches and some chances to explore the banks in our area. The Arrow rises in the Lickeys and is difficult to follow as it passes Cofton Hackett and feeds into Lower Bittell reservoir, sometimes in complicated channelling. 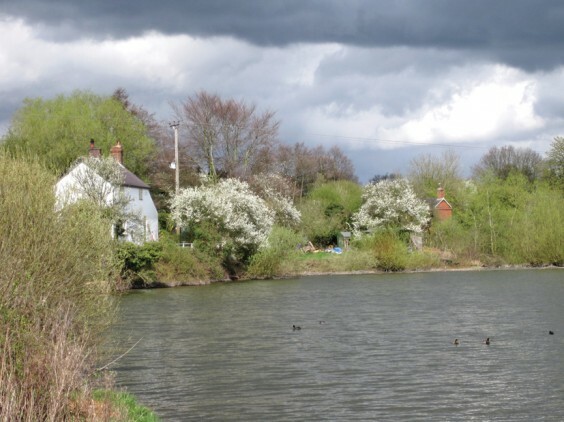 It comes out below the reservoir and then is easier to trace through Alvechurch, where it fringes The Meadows, round the side of Bordesley to reach Redditch. In our area it is usually well behaved though it sometimes floods into fields, and it has caused serious flooding in Alcester further down. It eventually joins the Avon. On its stretch through Alvechurch its water power used to be the heart of our industry, with several mills along it. Properties on Old Rectory Lane and the current Mill and Mill Farm on Radford Road share this history. Just beyond them were the old fish ponds for the Bishop’s Palace. Around Bittell it is part of the complex of canal and reservoirs, where water flow is expertly managed. The best access to it is in Alvechurch, along the footpath linking Old Rectory Lane with Old Birmingham Road (muddy! ), and in The Meadows. You can also see it well at the bridges on Lodge Farm Lane and Grange Lane. At this time of year there are interesting plants to see alongside. Perhaps the most striking is butterbur, which you can find at the Grange Lane bridge and near the M42 underpass. It is a large pinkish brush-like flower. Later it has huge leaves, almost like soft rhubarb, which used to be used to wrap butter and other foods to keep them cool. The riverside is also a good place to see the first wild garlic leaves appear, and you can find these now near Old Rectory Lane and in The Meadows. They will soon be followed by wood anemones. Later in the year, of course, you will find Indian balsam along the Arrow. This invasive plant spreads widely by running water. It is very beautiful, but has a bad effect on other species. Also in the stretch near the M42 I have found hemlock growing. This is a bit like cow parsley but has spotted stems and a bad smell, and is highly poisonous. People have told me about seeing kingfishers along the Arrow, and even otters. I have seen neither myself but can believe they’re there. I have seen kingfishers often along the canal, though. These tiny birds always lift the heart with their vivid colours and darting flight. The human-made canal is ironically a much better wildlife corridor than the natural river: that is, as long as its banks are properly managed. At the moment the Canals and Rivers Trust has got it right about the canalside vegetation. They are only mowing half-a-metre each side of the towpath throughout the growing season. The remaining waterside and hedgeside vegetation gets cut once in winter. This is a great regimen for wild plants, and therefore for the insects and birds that depend on them. The use of the canal for fishing and narrowboats is generally positive and makes sure it is maintained, though sometimes people are destructive to vegetation. It’s good to see narrowboats with solar panels and wind turbines, as well as smelling the lovely wood-fired stoves. They haven’t yet got the management of hedges right, mechanically cutting them hard back in winter. Perhaps one day they will. These hedges need to flower and fruit, so thrive best on a three-year cutting cycle which always allows some branches to grow fully. Nevertheless there are some good stretches of laid hedge and some set back from the towpath which are magnificent, and some great trees especially where the canal passes through old woodland. And, of course, the non-towpath side is often left to grow properly. At this time of year the blossom is getting going. First you will see cherry-plum (for example by the M42 bridge). Then there will be bullace (wild plum) and wilding plum trees (both near Alvechurch marina if Network Rail haven’t cut them down, but also plenty along the stretch south of Tardebigge). Then comes the blackthorn, small starry white flowers smothering the banks and hedges – quite spectacular in places. All of these are vital to insects and birds in this new season. Next, in April, will be the beautiful wild cherry, with much bigger white flowers and quite common along the canal. And then, the apple blossom, bold and pink. There’s a lovely wilding apple near the dead arm. Under the hedge there will be cow parsley and garlic mustard in flower in March or April, along with bluebells near old woodland. There will be lots of celandines and maybe primroses, and definitely cuckoo pint. Along some stretches, especially near Bittell, are lovely stretches covered with white violets, beautifully scented. There is also a little plant with blue flowers called ground ivy, which used to be used for herbal teas. On the water’s edge plants are coming back too. The most noticeable one at this time is common sedge. This begins with a stiff black head which gradually covers with yellow pollen and droops. If you’re lucky you might find the weird fruiting bodies of horsetail, like little brown asparagus spears! And of course, on the closely mown stretches, there are daisies galore. You can also find the bold and beautiful kingcup, or marsh marigold, like a giant buttercup. Lady’s smock flowers by the canal, as well as in wet meadows near the Arrow. The Bittell reservoirs are mostly inaccessible unless you’re a member of a fishing or sailing club. The same goes for Cofton Lake. The north side of Upper Bittell has a site of special scientific interest with rare shoreline plants, but you can’t see it. However, just north of this the footpath takes you through some good trees with plenty if blackthorn and some moschatel. This lovely little plant also grows near Tardebigge tunnel with its green “clock face” flowers. Tardebigge reservoir (pictured above) is easy to walk along one side as it is next to the canal. The trees and bushes along the river and canals are a great place to hear and see birds. As well as chaffinches (which I first heard on February 7 this year), greenfinches, blackbirds and thrushes calling, you will also start to hear the spring visitors. My favourite is the chiffchaff, which has a bouncy “chiff-chaff-chiff-chaff” song. Soon the swallows will swoop over the reservoirs and we will know spring has really come. On all of these human-made waters there is excellent water-bird life. In early spring, they are mating and soon nesting and laying eggs. Be careful around them at these times. If you frighten them away from their nests, their eggs are vulnerable to the herons and mink that also frequent the canal. The best mating display, I think, is the complex dance of the grebe. They aren’t usually on the canal but I have seen them on Tardebigge reservoir and Cofton Lake. The bit where they make a perfect heart shape with their necks and heads together is amazing. But even the humble mallard is interesting – the duck looks terribly trodden on in the water, but rises up afterwards shaking her wings in a very exhilarating way. I will keep my eyes open to see if the barnacle goose has migrated, as it should in spring. I’m also watching the swan family. Swans often breed in the upper waters of the Arrow, on pools near Cofton church. They hang about all year in my Withybed stretch of the canal. This year all six cygnets grew up to adulthood, but then one seems to have been driven away. At the moment five are still with the parents, but I expect them to go soon to start forming their own relationships. This is a lovely time to walk by water, even if the path is still muddy! Enjoy the sights, sounds and smells, and remember what a crucial part these “wildlife corridors” play in keeping our world truly green. As you may have gathered, one of my other passions is music. I wrote this poem on hearing of the death of Pete Seeger last month. Remembered who he was, and the young learnt. I still can’t sing it sitting on a chair. Unless we all learned to participate. Showing how long the march has been.